Bring the full color of the holidays to your Christmas lights this year with this multicolor LED Christmas Light Ball. Each 5MM LED light is individually wrapped to the frame for an amazingly uniform appearance that looks fabulous even up close. The fold-flat frame assembles in seconds, then stores away with ease. 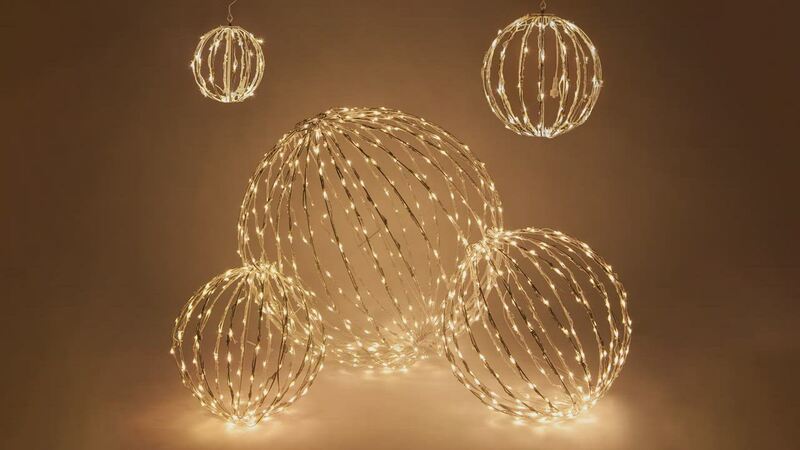 Plus these light balls can be connected end-to-end: up to five together for the 16" size; four for the 20" size and two for the 32". Hang this light ball from branches, patios and porches, inside or out. The hollow center is ideal for filling with flowers, greenery, ribbon, or whatever your imagination comes up with. The dual-bar center post adds stability. The black frames all but disappears at night, leaving a globe of delightful color!